Nonstick cookware has received a lot of negative attention over the years, and we think it's time to clear the air. Cooks and chefs everywhere heavily use nonstick pans for everything from omelets to sauces. Using nonstick cookware is especially important for healthy, low fat cooking. However, people do have some concerns about the safety of nonstick, primarily the environmental concerns about Perfluorooctanoic acid (PFOA), which is used to bond many nonstick coatings to the pan. PFOA does not occur naturally in our environment. PFOA has been labeled by the EPA as a carcinogen and has been shown in laboratory tests to cause cancer and low birth weight as well as other harmful effects. The EPA is currently investigating PFOA and its effects on our environment. Teflon, invented by DuPont in the 1930's, is popular type of non-stick cookware. Teflon nonstick coatings for cookware are based on PTFE (polytetrafluoroethylene), which is a high-performance fluoropolymer. PTFE has received attention in recent years due to questions about PFOA, which is a processing aid that has been used to manufacture PTFE. The EPA has asked DuPont and other companies which use PFOA to phase out its use. By the year 2015, PFOA should be completely phased out of manufacturing processes in the United States. Nobody knows for sure how this chemical is transmitted to humans and there's no direct evidence that PFOA from nonstick cookware is to blame. If you use your nonstick cookware properly, you shouldn't have much to worry about. Most nonstick has a maximum temperature rating of 500° F, which is when the nonstick coating will start to break down and dangerous gases could be released. Using metal utensils on non-stick cookware can scratch the coating and manufacturers recommend washing by hand using non abrasive cleaners or sponges (steel wool can damage the coating, as well as the dishwasher). This type of non-stick cookware can still release toxins. 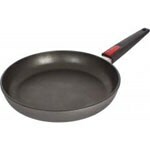 At high temperatures, Teflon is known to release at least 15 types of toxic particles and gases. These chemicals are known to be poisonous to birds. In humans, they can cause headaches, chills, backache and fever. Is there any cookware that doesn't contain PFOA? If you have concerns about using Teflon or other types of nonstick cookware, you have some options. 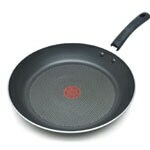 Woll cookware is brand of PTFE & PFOA-free nonstick cookware. Woll Diamond Plus & nowo Titanium cookware offer many advantages over other types of nonstick cookware. The Woll Diamond Plus series is made from hand cast aluminum with a nonstick coating that is diamond reinforced. Diamond reinforced coated cookware is great because diamonds are naturally nonstick and more durable than most metals. This cookware is so durable that it's cut and abrasion resistant (and also safe with metal utensils). The cookware is also oven safe up to 480° F. Woll Diamond Plus features an induction feature, which means the cookware has an edge to edge stainless steel bottom. This is great for having the most efficient heat transfer, which means these pots heat up pretty fast (about 3 minutes). Diamonds conduct heat four times as fast as copper, and the surface conducts heat evenly with no hot spots. Like the Diamond Plus series, Woll nowo Titanium is made from cast aluminum but the main difference is the non-stick coating. 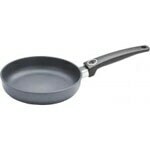 This cookware has a titanium plasma non-stick coating which is also cut and abrasion resistant. Both practical and space-saving, nowo Titanium has detachable handles which turns the cookware into an oven-safe casserole dish. The detachable handle (not oven safe) slides off at the push of a button and which is also great for storing this cookware in a small kitchen. Woll cookware is perfect for those who are seeking a health-conscious, low-fat style of cooking. Their non-stick coatings allow you to prepare food with little or even no fats like oil and butter...without sticking! The coating also makes for easy clean up and unlike most non-stick cookware, you can wash it in the dishwasher.